Home Marijuana Investor Wire Marijuana for Fun, Crosses $105 Million in March Alone (MJBiz). Total sales for 2017 were $1,507,702,219. 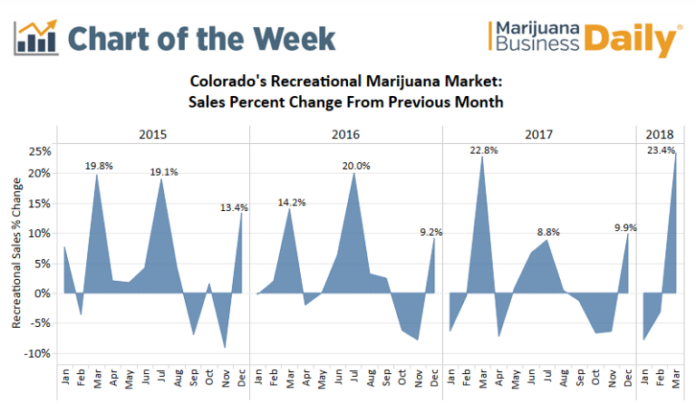 Marijuana Business Daily reported that recreational marijuana sales in Colorado eclipsed $105 million in March 2018, the highest monthly total for adult-use sales in the program’s history. Read the full article at MBD. Next articleTake a Toke and Go On a Storm Chaser Tour This Season.